I have a client who would like to edit a users permissions. However instead of adding permissions on a per user basis, they would like to remove permissions for that user by unchecking the item. However because it's enabled for the users usergroup it's not possible to uncheck. Am I missing something? Or should we create a new user group? So in the above photo I'd like to uncheck, for this user only, a couple of different permissions. A user inherits the permissions of any user groups they belong to additively. If you want to remove specific permissions for that user, you'd need to remove them from the user group(s) they're currently in and either create a new user group for them with their specific permission or add the permissions directly to the user. Not the answer you're looking for? Browse other questions tagged users permissions user-groups or ask your own question. Restrict user editing permissions within a user's group? User permissions on a per-entry basis? 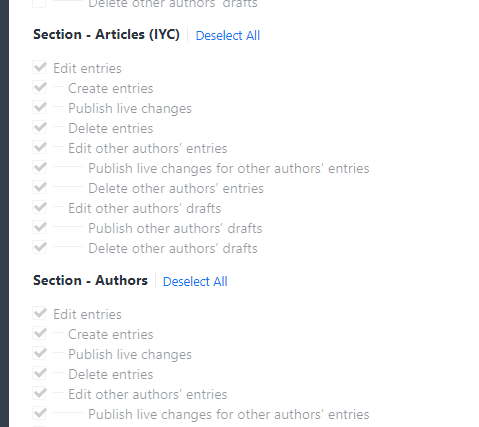 Restict admin user permissions to only editing users he/she has created. Permissions by Group - beyond standard?